I've mentioned in previous posts that I'm a graphic design student and one of my favourite parts of design is branding identity. In short, branding identity is the whole "look" of a company and I can tell you that Philosophy has got it spot on. When I saw all the beautifully designed bottles and boxes all stacked in neat rows, it did something to me. I probably sound like such a nerd here haha, but I just knew I had to buy something from the counter. 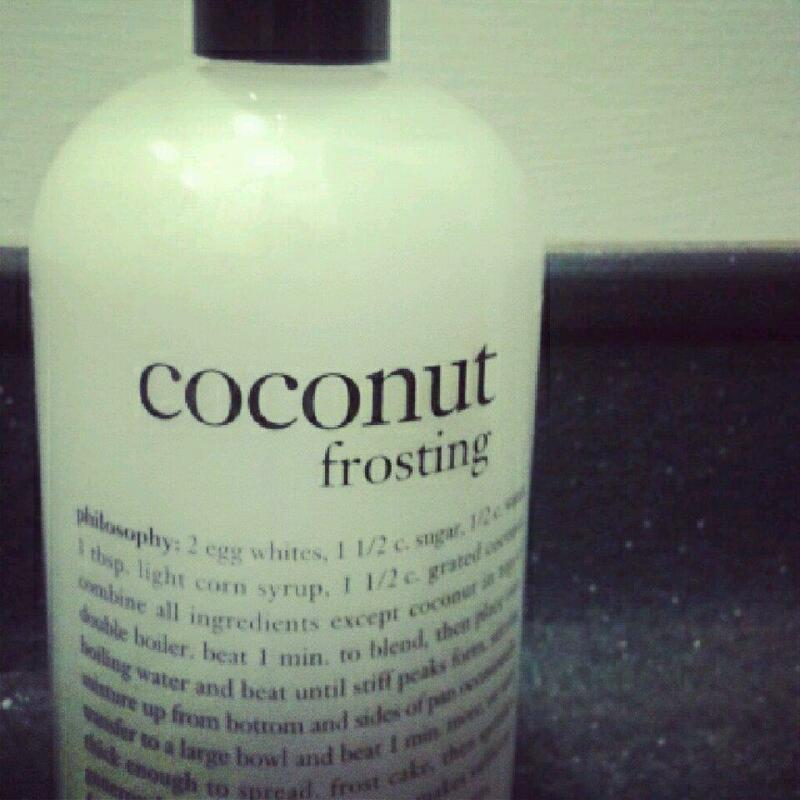 I eventually (as you will already know) picked out a 3 in 1 shower gel, shampoo and bubble bath in the scent Coconut Frosting because coconut is like my favourite scent ever. I ignored the hefty £20 price tag and practically skipped to the till and that brings us to the here and now. I've only used this as shower gel so far as I already have a favourite shampoo and I don't have a bath but I can't even begin to tell you how fantastic this product is. Not only does it smell divine and look great in my shower, but it does absolute wonders for my skin. I probably have the most sensitive skin in the world. I used to have horrendous eczema (which has thankfully cleared) and all I have to do is walk past Lush and I get all itchy and breakout (I'm not even joking). On a good day my skin just dries out and I have to practically bathe in moisturiser which I hate because my skin always feels really greasy afterwards, yet with this I never once itched or broke out and I didn't even need moisturiser afterwards - seriously! But my love this product doesn't end there. Oh no, no, no! I decided to go back to the counter to get some presents for my friends birthday. I picked out Vanilla Birthday Cake for obvious reasons and then had a look around to see if there was anything else I could get. I don't know how I missed this first time round, as it's kind of the whole point of Philosophy but, nearly all the bottles have really beautiful and encouraging messages about God and faith written on them. I'm a Christian and so is my friend so I knew she'd really appreciate it. I just thought it was so lovely and I was amazed that a mainstream brand have done something like this. I got her the Inner Grace body lotion because the message on the bottle was just so powerful, talking about walking hand in hand with God. There were other bottles that had empowering messages that didn't mention God, so if you're not a Christian or really into that kind of thing, it still has that really nice touch. So there we go. I'm in love. With a skincare brand. If you have it in you to ignore the fact that the items are slightly over priced then I would seriously suggest trying out some of the products yourself. I'm keen to try Cinammon Buns and Vanilla Birthday Cake shower gel as well as a few of the lotions - I may even let you know what I make of them hehe. Philosophy's slogan is "believe in miracles" and you know what, I might just be on my way.